Meat so tender and juicy it just melts in your mouth. Mmmm! This is what I will be discussing today… my Paleo Mississippi Pot Roast recipe! I will fill you in on how I made a gluten-free Mississippi Pot Roast without any seasoning packets. We DIY over here! I included my recipe for both the seasoning and the roast. This slow-cooker recipe requires minimal prep and then you load the meat into your slow-cooker and it does all of the work for you… set it and forget it! This is a simple way to ensure that you will have a mouthwatering meal waiting for you after a long, busy day at work. Skip the ranch seasoning packet and make your own ranch seasoning! If you are a seasoned cook (pun intended) you should already have all, if not most, of these ingredients, stashed away in your pantry for this Paleo Mississippi Roast. I had everything on hand so I experimented here and created this ranch-flavored seasoning to coat my meat with. Simply mix all of these ingredients together in a small bowl and set aside. You will rub this completely on your roast. You likely will not need all of it but at least half and the other half can be reserved for a future use. Keep reading to see how I used the rest of my seasoning. This recipe will feed 4-5 people if you go with a 2 1/2 lb roast like I did. If you need to feed more, simply purchase a larger roast. Rub your roast with the ranch seasoning that you created. Warm 2 tablespoons of ghee in a large skillet or frying pan. When the pan is warm and ghee is melted place your roast in there and brown on all sides. Once meat is browned place in slow-cooker. Add one cup of beef broth to slow-cooker. Top meat with 3 tablespoons of ghee. It will melt down on the meat and infuse it with flavor and juiciness. Top the roast with pepperoncinis. I ended up using half a jar. Remove meat from slow-cooker and place on platter to slice and serve. Eat and enjoy! Serve with your favorite side-dish or use my suggestion below for roasted ranch potatoes. Looking for a way to use up that ranch seasoning that you created? I had quite a bit of ranch seasoning leftover so what I did was tossed some potatoes with some extra virgin olive oil and coated them with the ranch seasoning. I roasted these potato halves in the oven at 400-degrees for approximately 25-30 minutes and they came out fork-tender. This potato medley is the perfect accompaniment to your Mississippi Pot Roast. If you want to keep your meal totally paleo be sure to use roasted sweet potatoes since those fall within paleo guidelines. In the photo below, I used one small bag of multi-colored mini potatoes and fingerlings. I sliced them all down the middle for quicker roasting. Skip the butter and go with Fourth & Heart Ghee. Shop on Amazon. This is one of my go-to brands of ghee. My mother and step-dad stopped over for dinner last night and this was what I served. We sure polished this meal off. There was nothing left and we all joined the Clean Plate Club. This is the type of dinner that I love to serve to guests of my home. It is great comfort food and it is a filling dish. We all had to leave some room for dessert though! I created a vegan matcha and chocolate cheesecake and that was our dessert. I am currently working on a recipe post for that and hope to post it soon. Does this look like a recipe that your family would enjoy? If you do decide to make this dish let me know how you like it. Leave me a comment and let me know. 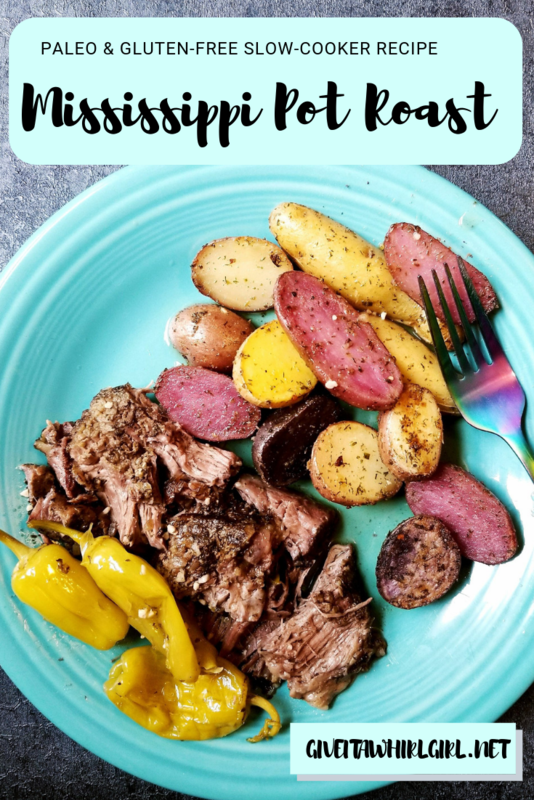 This entry was posted in My Cooking Journey, Recipes and tagged DeLallo, fingerling potatoes, ghee, gluten free, glutenfree, meat, Mississippi Roast, Organic Valley, paleo, pepperoncini, pot roast, potaotes, purple potatoes, recipe, red potatoes, roast, roasted, slow cooker. Bookmark the permalink. This pot roast is absolutely delicious! The pepperoncinis give it such a nice flavor. Just a little kick! I am so grateful to sample Give It A Whirl Girl’s delicious creations!